Today I’m sharing a photo that represents how you see yourself. 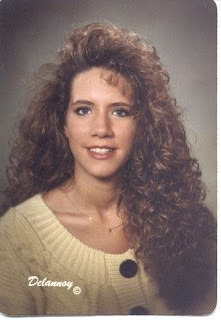 This was my high school senior picture and I remember that day like it was yesterday. I remember getting up and planning what I was going to wear for pictures that day, and being glad that it was a Friday and that I didn’t have to work. And the best part about that day was how incredibly awesome my hair turned out! I mean look at it! Everything went well… the curls…. my huge bangs…. everything! Perfect! That night my friends and I went out partying to a movie and dinner. We had a blast. So you’re wondering why that picture? Why do you see yourself that way? And the answer to that question is, I’m not sure. It’s me. A much younger version of me that’s for sure. When I look in the mirror I often times see that person. I see the person that had all these grand hopes and dreams for the future but still had no idea what they were going to do. Living day to day, having fun with friends and with barely a care in the world. Some people loved high school, some hated it, and some were just indifferent about it. I loved it. If you asked me if I liked it back then I’m sure I would have told you no. It was a good time in my life. A time that I look back on often and wonder where did all the years go? How has it been almost 20 years since I’ve graduated! I’ve changed a lot since then. I’ve learned a lot. Made mistakes. I’ve gone to college. Gotten married. Gotten divorced. Married again. I’ve traveled. I’ve had children. I’ve seen the world change around me at a very fast pace.